Come be a part of our translation team! Our translators are independent contractors who work with us on a per-project basis. We are looking for small teams, single language vendors and/or regional language vendors in particular, but we invite all interested linguists to contact us. Ability to use CAT tools is required. Use of memoQ is a plus. If you meet the above criteria, please email the Translations Department to request the online application. Please attach a CV/resume and/or company profile to the email. Note: This page will be updated at the beginning of each month, or in the event a special need arises. If you do not work with any of the listed language combinations but are still interested in working with us, we invite you to check this page periodically for updates. If you have any questions, please contact us at the above email, or by phone at (+1) 513.792.5026. 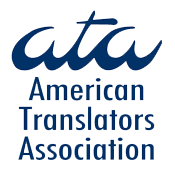 As a Corporate Member of the American Translators Association, we monitor developments in certification, technology, and the profession as a whole. Click on the logo to visit their website to learn more about this excellent organization, and how to become a member.